The 11-2 chance was one of a number of horses who took the wrong course round this cross-country circuit in December, but there were no such dramas on this occasion and Philip Hobbs' charge was jumping out of Richard Johnson's hands throughout the contest, in which he was never too far off the lead. Wedger Pardy, who led his rivals the wrong way in December, was still bang there turning for home and the 14-year-old A New Story, winner of the race in 2010, came to challenge at the final fence. He and Balthazar King fought it out up the punishing hill and it was the latter who won the argument by a head. Johnson said: "He seems to have really taken to the fences well. He ran well the last day until we got taken out. He battled all the way to the winning post, so it's very good. We went a good gallop all the way and he does stay very well, which has helped him in the end. "After last time I wondered if I should ride in it, but this was great." Hobbs added: "If he had won last time then he would have gone up in the handicap and might not have won today. "He had a very bad fall at the course. He broke a bone in his cheek, so we knew he would have to have some time off. He jumped very well and he tries hard. It's a different race but they all count." Michael Hourigan, trainer of A New Story said: "He just loves this place and comes alive here. He's been unlucky a couple of times but he wasn't today, he was beaten by a better horse on the day. This was his 99th race and his 100th will be in France in June." However, there was a sad postscript to the race as six-times course winner Garde Champetre and favourite Scotsirish had to be put down. Few beaten trainers will be more delighted this week than Michael Hourigan, few defeated riders more relieved than Jacqueline Coward following another epic marathon in the Glenfarclas Cross-Country Chase. Limerick-based Hourigan drew huge pleasure from A New Story’s runner-up spot, for the 14-year-old belied his years to run the winner, eight-year-old Balthazar King, to a head. A New Story, who looked regal in the paddock, won the race in 2010 and has also finished twice third and once fourth. Hourigan said: “You wouldn’t think he was 14, and that was his 99th race. He just loves this place. He’s always knocking at the door and with a bit of luck might have won it four times in a row. Adrian [Heskin] gave him some ride today. “Punchestown has a bigger bank, and while he’s run well there I wouldn’t like anything to happen to him, so he won’t be going there. His next run will be in France at Angers where he was fourth last year. For amateur rider Coward from Yorkshire her third place on Wedger Pardy was sweet consolation after she took the wrong course in the cross-country race at the January meeting. Coward, a granddaughter of trainer Mick Easterby, made most of the running until the second-last, and said: “That was amazing, incredible. I knew I was going the right way, but I also knew Dickie [Johnson on the winner] was going very well behind me. Wedger Pardy’s owner, Lord Leigh, bought the horse at one of Brightwells’ Cheltenham sales. He said: “Someone just said, ‘that’s the best 10 grand you ever spent’, and they are probably right. He had a good cross-country record before I bought him and it’s a form of racing I enjoy. “We kept faith with Jacqueline because she rode a fantastic race despite taking the wrong course last time. She made a mistake and we can all do that. She had been wasting to do the weight for three weeks and she’s been rewarded. She’s very determined. There was sad news following the Glenfarclas Cross Country Handicap Steeple Chase because both Garde Champetre and Scotsirish were humanely put down after being injured between fences on the flat. Garde Champetre, trained by Enda Bolger and owned by J P McManus, fractured a foreleg. 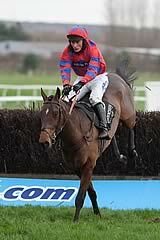 He had won six times over Cheltenham’s Cross Country Course, including taking this race twice, in 2008 and 2009. Scotsirish, trained by Willie Mullins and owned by Double R Stables Syndicate, fractured a hind cannon bone. He had won nine times under Rules.